This entry was posted in Fashion, Fashion Week, Menswear and tagged basics, bob squad, bohemian prints bohemian, collection, collection review, cutwork, dress, embelleished, embellished, Fashion review, fashion week, Feeha Jamshed, floral, flower print, fun, fun print, gowns, grey, indo jap, jumper, jumpsuit, lace, lattic, lattice, Maria B, menswrat, mona darling, MUSE, optical illusion, owais, owais fashion blogger, owais haji, owaishaji, pakistan fashion, pakistan fashion week, pakistan fashion week 2016, pakistani fashion, pastel florals, pastels, PFDC, PFDC Sunsilk Fashion Week, pinstripe, power suit, print on print, prints, PSFW, psfw day 1, psfw16, relaxed shapes, review, Sana Safinaz, sara shahid, separates, sequins, seventies, solids, Sport influenced, sportswear, Sporty, sporty chic, sublime. Day 2 saw another slew of designers putting forth a show for the evening. Of these only two came up trumps by staying true to their aesthetics. 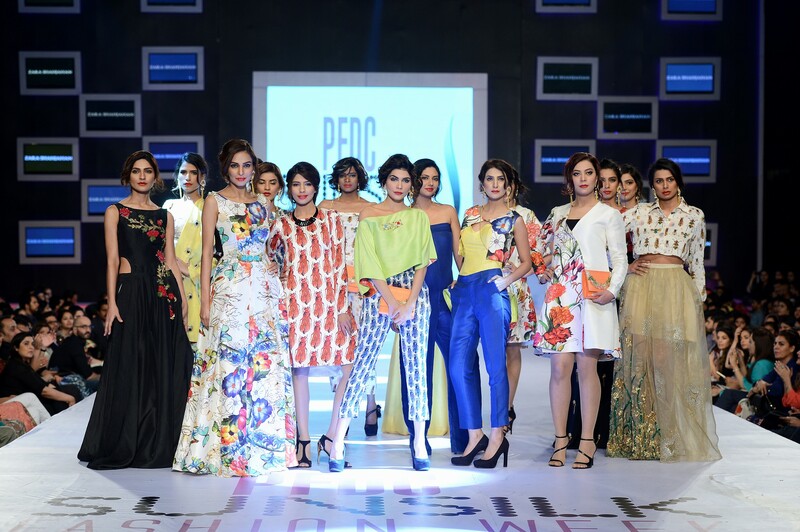 While we saw many bridals, a couple of brands also showcased pret a porter for the wedding season giving the much needed break from the usual desi wedding options. This entry was posted in Collections, Fashion, Fashion Week and tagged ball gowns, bandhgala, beading, bedsheet gown, black and gold, botanical, botanical prints, bridal, brocade, capes, clean, collection, colors, commercial, crop top, culottes, dark kitsch, Deepak Perwani, desi brides, desi shaadi, desi wedding, desi weddings, designer wedding wear, disco, dress, dresses, elan, embellieshed, embellished, embroidered, embroidery, fashion pakistan, Fashion Pakistan week, Fashion Pakistan Week 2015, fashion pakistan week winter festive, fauna, floral, Fnkasia, formal, formals, fpw15, gharara, gown, gowns, Huma Adnan, jackets, jumpsuit, khadija shah, lehnga, luxe, luxury, Maheen Karim, menswear, nida azwer, obaid sheikh, pakistani bridals, pakistani designers, pakistani fashion, pakistani wedding, power suit, pret, printed, riot of colors, sari, shaadi, sharara, Sherwani, silk, silver, skirt, skirts, velvet, velvet pants, Wardha saleem, wedding. 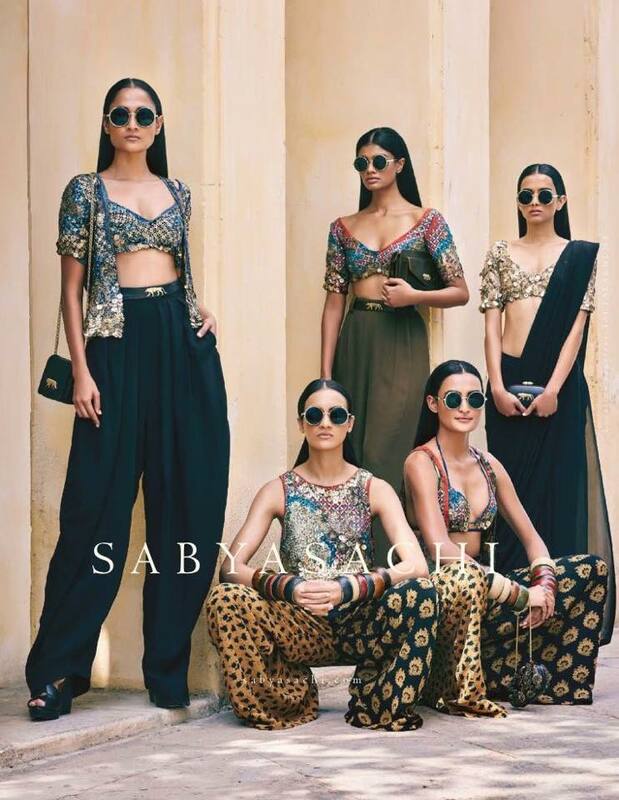 There is a reason I am a fan of Sabyasachi’s much more contemporary looks and interpretations and Sabyasachi’s pret line Sabyasachi by Sabyasachi is a testament to that why. This people is what looks like a retro boho chic collection done right to pitch perfection looks like. 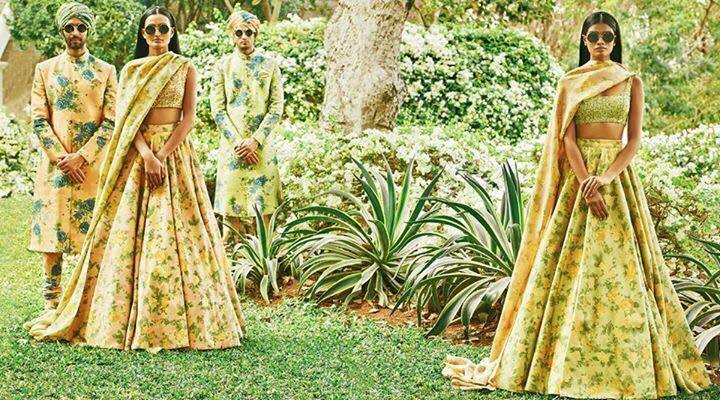 Sabyasachi opened the Lakme fashion week with a bang that only he can. The scale, the setting at the mill and the disco laser lights all contributed to a somewhat an epic saga to the seventies. The boho luxe collection was one of the best I have seen from the man and one can see why. The striped crop tops, the floral prints, the full skirts, the jumpsuits,even the menswear all came together for a seventies collection that paid ode to the bollywood queens of seventies Parveen Babi and Zeenat aman. The slinky sequined dresses, the floaty boho dresses, print-on-print flared pants and shirts, crystallized louche tunics, the bling was definitely on a high note playing tribute to the nightclubs and party scene of the seventies. The leather belts with lion motif on saris and dresses, the retro shades, the slick back hair, the collection that was styled to perfection also threw in a couple of sporty references within with numbered dresses that surprisingly did not look out of place (and reminded me of Tom Ford). The print on print menswear was one I have been lusting after since last season and this year he amped up the quotient with suits, bandhgalas, waistcoats worn over print on print churidar and tunic (I have tried that but not with the same prints). Many (read each) piece was bang on nailed perfectly and added to the whole colllection be it the basic seperates of the whole dress. One of the black dresses with red lining and paired up with printed pants, the gold shoes and accenting shoes on men, the mint green sequined dress are definitely worth the mention. The half and half pants, the fiery red floral pieces all just were literally effing good. Though I hated the slipper effect on men but just a minor glitch. 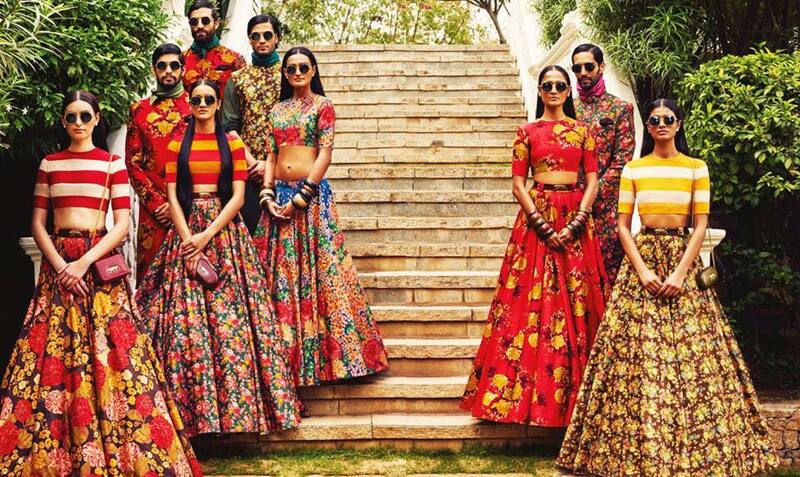 Aiming at the younger audience, this has to be Sabyasachi’s most commercial pret collection ever. While I still do miss the artsy Sabya from the heydays of his Frida Kahlo sensibilities, (it is still there), fashion ultimately is a business and he has grown as a designer by leaps and bounds becoming a movement towards textiles within his own right. While this collection is more closer to his earlier works than his traditional couture endeavors, one would definitely make comparasions. But obviously the evolution is going to spill over to the artsy him but the amalgamation of the two is what was presented here. Even within his va va voom glam outing there is a certain quirk of sensibilities that does shine through (more so than his recent outings) and that is what I was so happy about!! 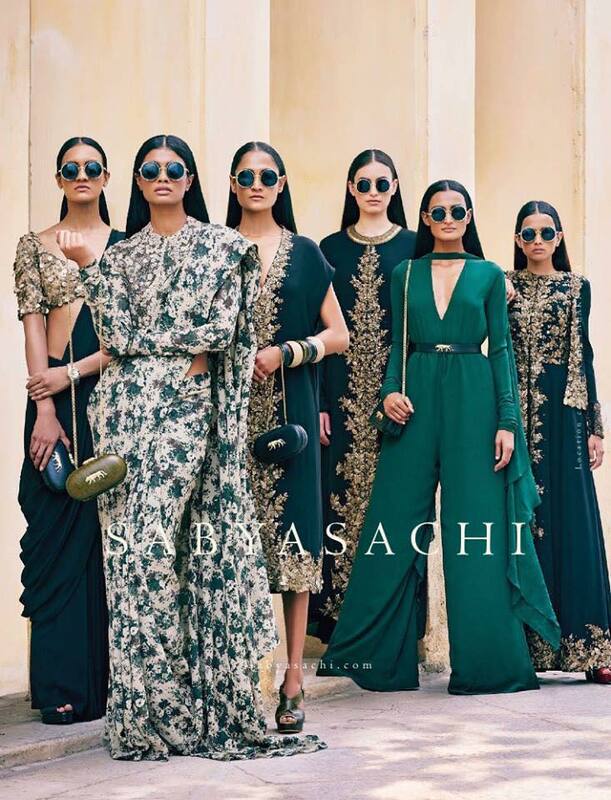 the return of the earlier Sabyasachi. This entry was posted in Collections, Fashion Week, Menswear and tagged 70s collection, belted sari, bohemian, boho, boho chic, boho luxe, crop tops, croptop, floral, flower power, full skirts, indian textiles, jumpsuit, kitschy, Lakme Fashion week 2015, LFW15, menswear, print on print, prints, resort collection, retro, round glasses, Sabyasachi, sabyasachi by sabyasachi, sari, sequins, seventies, Sherwani, skirts, womenswear. The style award barely ever missteps the red carpet and this was no exception. The style award winner showed how its done and why did she win that award in a white wide legged Misha Nonoo jumpsuit and stunning black Dior jacket with Christian Louboutin shoes and a quirky printed Anya Hindmarch clutch. Keeping it chic she finished it off with side swept hair and red lips for that perfect contrast in a monochromatic look. The fierce model in a side swept hair and some smokin’ hot makeup was picture perfect in the sequined Burberry with thigh high slit. The gown with its black panels added the perfect contrast and the model of the year pulled it with aplomb. While she changed (read heated) things up for after party, even on red carpet the model’s fierce personality shone through the glam evening wear. Charlotte Gainsborough did everything right what Ather Hafeez for Sana Safinaz did not during its presentation. In head-to-toe in LV SS’15, the actress sported a sequined mini dress with front zipper detail. Downplaying that heavy dazzle, she paired it up with the cropped leather motorcycle jacket and patent ankle booties, styling off the glam biker look perfectly. Though couple of edgy accessories wouldn’t have hurt, but just a minor gripe one can let go. The man is epitome of being Sharply dressed…everytime.. do I even need to say he nails it?. The shawl satin lapels with a long scarf positioned perfectly with the perfect length, Ford attended BFAs in a sharp suit. Picking up LV veritcal striped suit for the event, Harry Styles dressed event and age appropriate and pretty much nailed it. The double breasted blazer, the boots and the buttoned down shirt sans the tie, the mod look suits him to a T. Its a look that is hippie, young and formal all together. The couple made one of its together appearances on the red carpet of BFAs in their own statement styles. While it was Gareth’s boots that I loved coz it just complimented designer’s sass , it was his partner Mccoll’s kimono inspired quilted leather jacket that caught my attention. The jacket was unusual yet perfect for a fall red carpet outing such as this. The actor put a spin on the conventional suit by combining multiple pieces from Burberry steering the look away from the usual look. Though the look had a relaxed vibe about it, with the oversized blazer over the checked blazer (its winter up there can you blame the guy), the look was sharp and made for a welcome change from the usual blues and black suits. The mixup was perfectly balanced with a charcoal shirt and tie paired with black trouser with that brown jacket. In a complimenting outfit with his girlfriend, race driver Lewis Hamilton opted for a grey suit, accenting it off with burgundy details. Looking dapper with a tie and pocket square, the Formula 1 star’s accessories tied in with the former Pussycat Doll’s deep red lipstick and intricate detailing on her gown. Good move on keeping the shoes in sync with the accessories. With his famous sky high quiff, the fun designer, as expected, put his fun twist to a formal event. Textured tweed jacket, black trouser a white shirt, the designer had to pull it altogether with that olive and blue fun blazer that pops the whole look to another level. The designer, who is never afraid of color, knows his sense of balance and pulls off his choices with aplomb. Trust Mr. Holland to bring a lil’ more fun to the party. This entry was posted in Fashion, Red Carpet and tagged Alexa Chung, Anna Kendrick, Anya Hindmarch, BFA red carpet, blush, british fashion awards, Burberry, Cara Delevingne, Carson Mccoll, Charlotte Gainsborough, CHARLOTTE GAINSBOROUGH Charlotte Gainsborough, Charlotte Olympia, Christian Louboutin, Christian Louboutin shoes, dresses, Emilia Wickstead, Emilio Pucci, Emma Watson, Gareth Pugh, gown, Harry Styles, Henry Holland, Jeremy Irvine, Jimmy Choo, jumpsuit, leather jacket, Lewis Hamilton, Louis Vuitton, LV, menswear, Misha Nonoo, Monochrome, motorcycle jacket, Paul Smith, red carpet, silver, the red carpet, Tinie Tempah, Tom ford, Victoria Beckham. 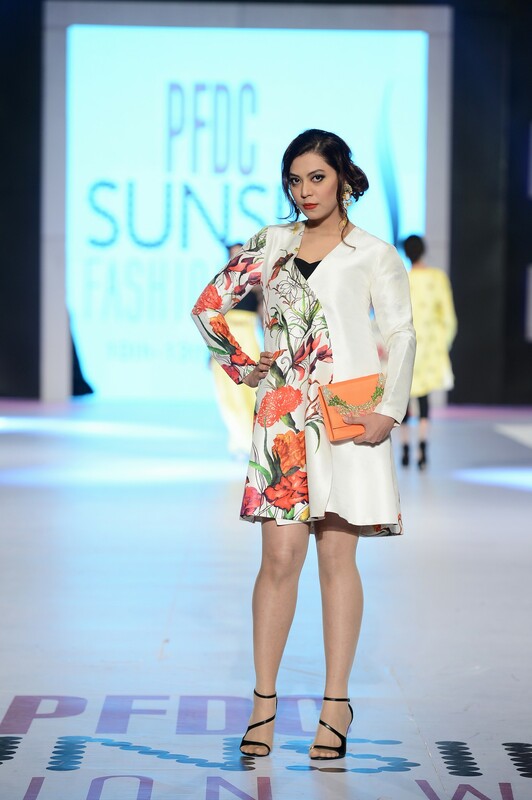 Kicking off things on the last day, Sadaf Malatere opened up the day with a chic collection that was sans any unnecessary drama. The fourth monochromatic collection during the fashion week was still a-fresh due to its minimal and sleek approach in design. Accompanied along with controlled pretty chinoiserie cherry blossom details that just hinted and teased at points rather than going OTT over the garment. The pretty collection started off with clean lines it successfully evolved into fringed accented ensembles that broke the whole linear monotony but without looking out of place. 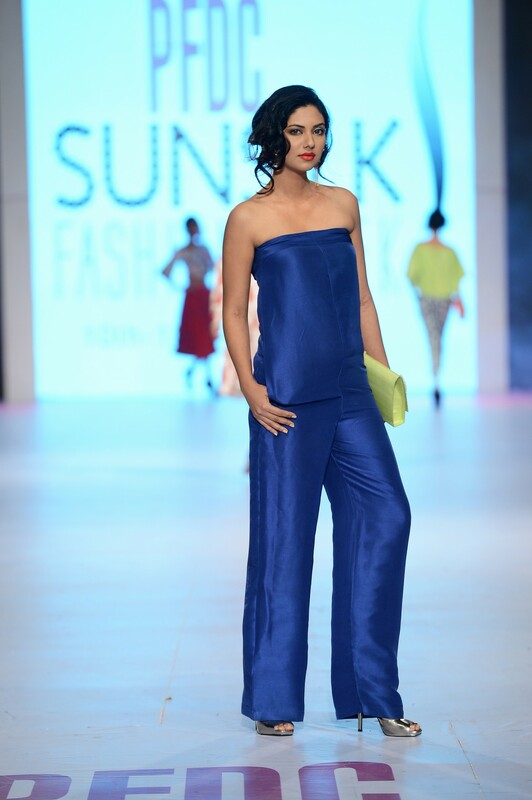 The effortlessly chic collection had a range of fun basics, dresses, separates as well as some fun fringed pieces. The collection was restrained and well made (shouldn’t we stop mentioning it since it is the basic pre-requisite). The collection with its part french part jazz references scored majorly due to its control that it exercised. Tres chic. 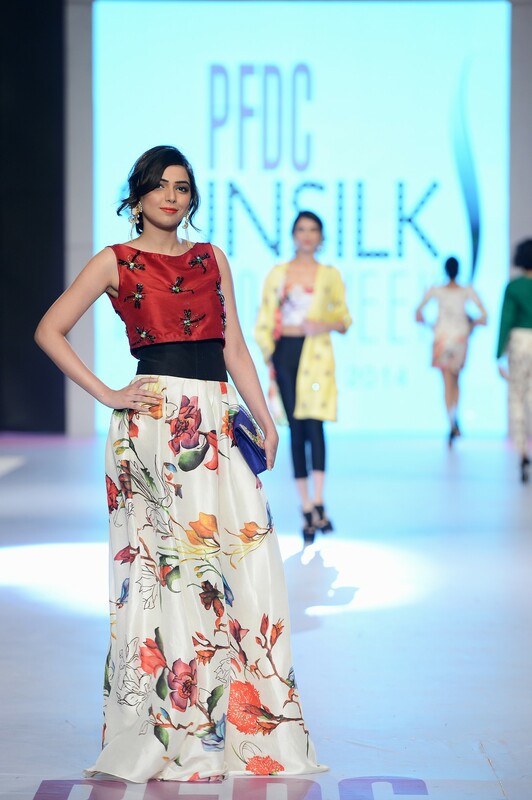 Maheen Karim’s latest offering was luxe, glam and more. While the collection was not without its share of uh-oh moments, the vibe surely was high and the designer managed to deliver what she is known for. While a shaky start with a heavly embellished ensemble in blush pink… the things progressed for the better. A few DVF references in matt golds were hard to miss…A departure of sorts,not totally, from her usual serving of prints, Karim focused more on embellished details in moderation and some of her signature laid back luxe and resort vibe. Though I expected the sole print she presented to be much more brighter in print, but nevertheless suited the winter season for which the collection was presented. The front short-back long tunic with glitter hot pants was rather an odd inclusion in the presentation. The presentation did manage to spring back some surprises (pun intended) and peaked most at the red jumpsuit with a deep cross over back, the black gown with gilded filigree detail that continued on the a fun cutout back that was unusual and sensuously luxe. Another one that stood out in the collection was a wrap drape that gathered up front. A good showing. After two successful pret runs earlier this year, Nida presented a Renaissance inspired collection moving away from the whites and pastels of summer, in an attempt to score a hattrick. She did manage to get halfway there. There was no dearth of fun and innovative renaissance inspired prints at Nida’s show in deep rich tones coupled with handworked embroidery. However she faltered on many counts in terms of silhouette and how the print and embroidery were coupled together, as well as separates that were put together. The metallic jacket with gharara, the black shrug, top and the layered gharara with different levels had some odd print pairings and looked more gypsy and carried a bit Ram Leela dejavu. Same was the case with saris paired with jacket (nothing wrong with that, I for one love the combo) with the two separates, not being in sync, and I thought she almost got rid of that front open floor length layered anarkali. While she started off strong with some interesting pieces thing went for a bit of an off balance half way through, but managed to end well with a printed slouched dress. 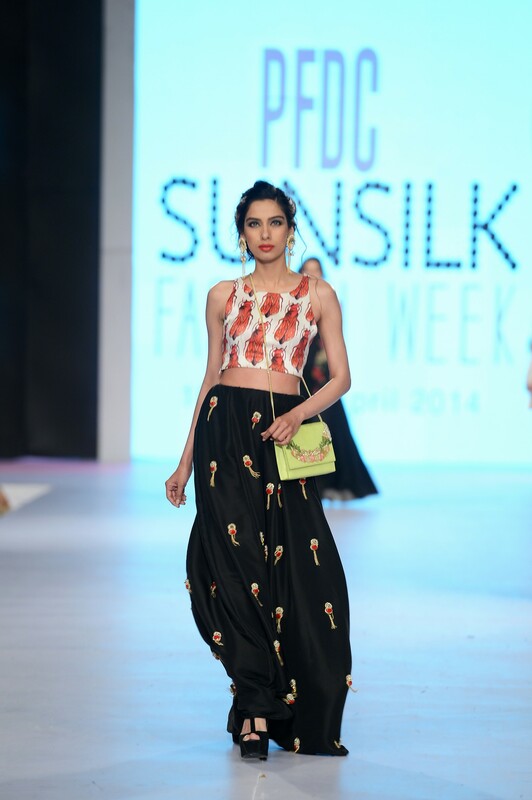 Loved the black self printed pants with laser cut top and a tunic over a sariesque gown. Also a short printed shrug belted over a mouse grey gown (not an easy color) were some of the highlights of the show. Some great prints (as expected) but I wished they were utilized better. 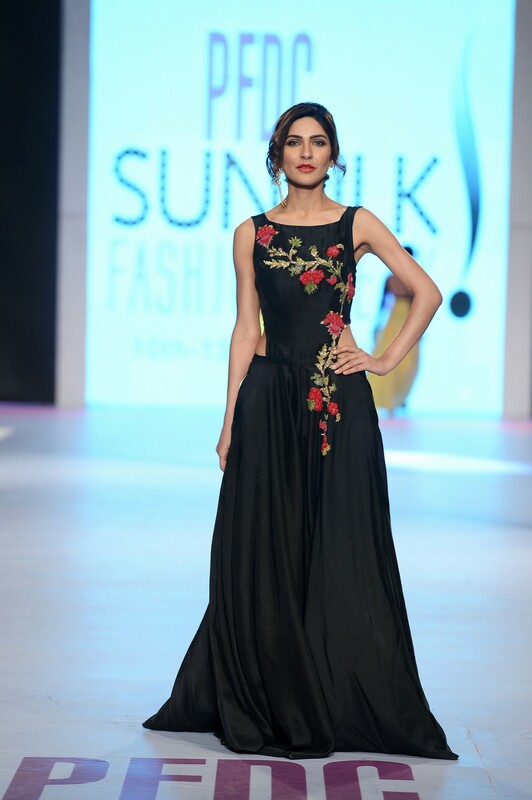 This entry was posted in Collections, Fashion, Fashion Week and tagged basic, black and white, collection, dresses, embroidery, fashion, fashion pakistan, Fashion Pakistan week, Fashion Pakistan Week 2014, fashion week, fashion week review, FPWAW14, french, fringes, gharara, gowns, jumpsuit, jumpsuit women, luxe, luxury, luxury pret, Maheen Karim, nida azwer, pret, print, prints, renaissance inspired, resorty, review, Sadaf Malatere, sadaf malaterre, separates, womenswear, womenswear pret. 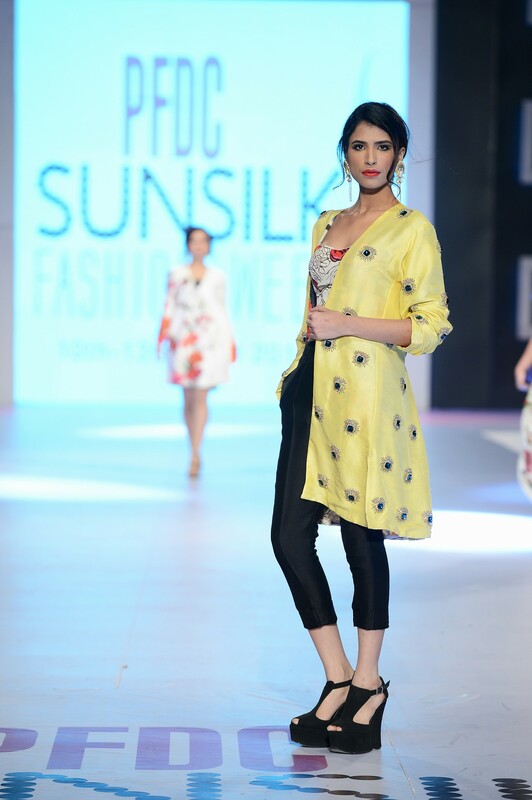 The buggy love of Zara Shahjahan came across with more hits than misses in second presentation of the day. The quirky collection, because of its subject matter, and treatment in print was one of the major talking points of the show. The fun elements and youthful vibe kept the whole presentation interesting. Using bugs as her main focus with a good… a very good amount of flora thrown in, this collection made it to many women’s must have list. Using her reference material, she created running buggy prints as well as placement specific ones. However she kept it from being gross and made them into fun elements through the rendering of the drawings of the prints. The overall bug prints were my favourite. 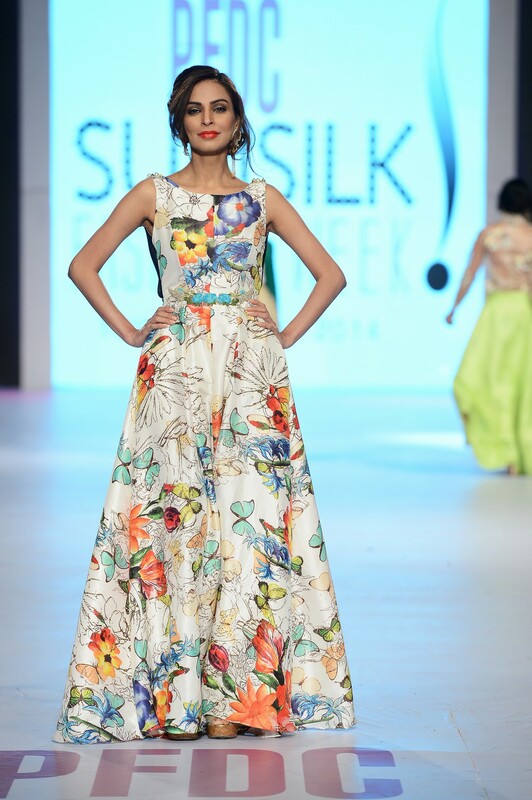 The visually exciting collection had quite a few of florals prints running through it with butterflies too that. Most of these prints were balanced off with an introduction of a solid color into the look. These prints at a few occasions were also embellished with hand embroidery. The one that caught my attention was a dragonfly repeated and embellished. 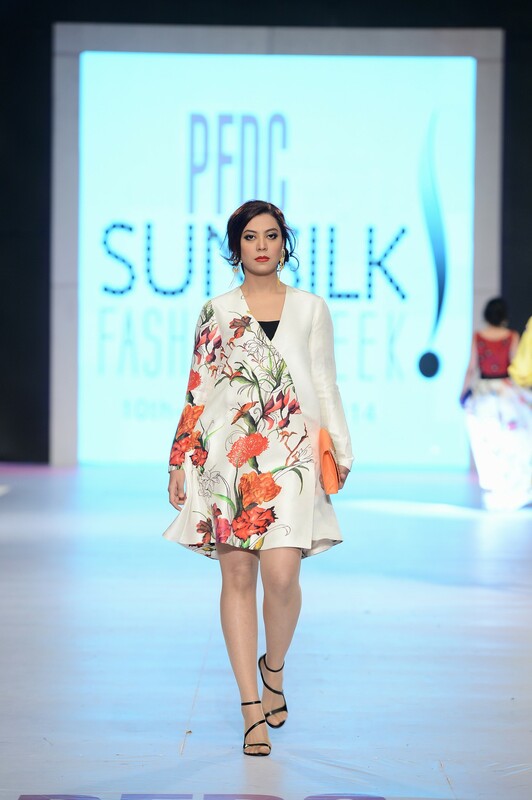 Major points to the lady for keeping the silhouettes clean and fuss free sans any drapes letting the prints shine. The straighter and structured look ran throughout the collection with jackets, pants, skirts, jumpsuits and crop tops. She, at many points, lets print do all the talking which was a good move. While the buggy-ness of it all might not appeal to all, the ones willing to have some fun, will surely snag it up as soon as it hits the store. Using silk, tulle and organza in her collection, she at points did play up with the sheer vs opaque layering, however I did wish she had explored that more in order to give depth and dimension in some of the ensembles. She managed to present a collection that had its share of hits and misses but scored major points because of its fun prints. The clothes were also paired with embroidered clutches that provided poppy accents to the looks. However there were sadly more than one miss in a collection that had such fun energy running through it. The sheer embroidered top with such a high neck seemed either not pressed or quite ill fitting. The skirt paired with it too, the whole look, with those earrings, looked like the look was trying too hard but not succeeding. Also the finishing of the same skirt along the hemline.. the puckering was pretty much evident. The sheer skirt, with a printed top, with a jacket, looked kinda all too much for one look. At one end (the top) it looked fun sans that blazer (such a unifor blazer) while below the waist the embroidery made it kinda look formal..combining two different vibes in a look is a pretty difficult terrain to tread on. Also the formal black and yellow piece, as much as I liked it, the look, with its evening and polished elan-esque vibe looked disconnected from the whole collection. Also the overlapped boxy silhouette, though not suppose to have any shape, looked rather frumpy and like an overlapped coat that was waiting to be taken off for the dress to be revealed (the other boxy silhouette was better than this one). The hemlines puckered and wobbled at more occasions than one and it was so sad to see that considering it was one collection that had all the potential to probably be flawless in execution. What I liked…the running prints of bugs and what she did with them. 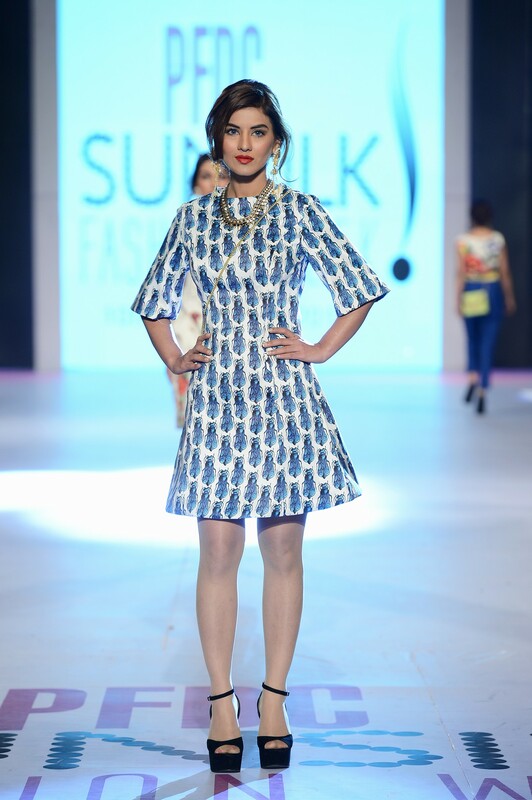 The structured dresses were a masterstroke with both the prints. 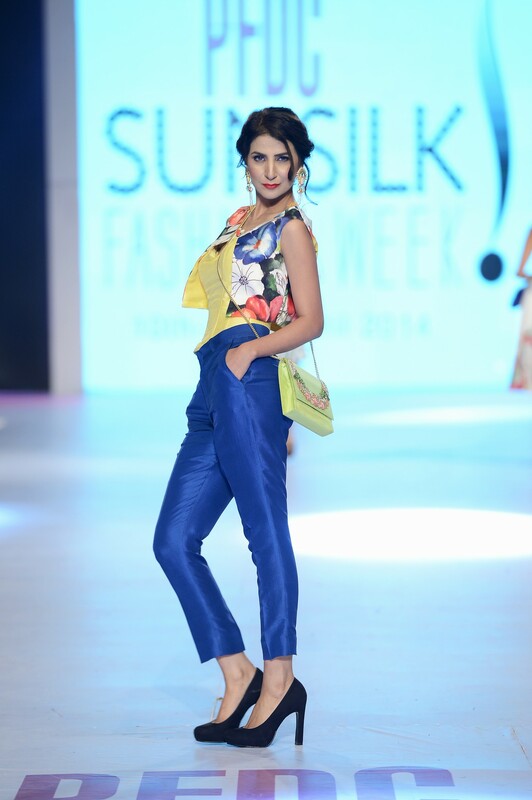 The blue jumpsuit with green clutch was such an undertoned and brilliant ode to ‘a bug’s life’. Love the strapless jumpsuit and how well it was stitched (what happened later then?? 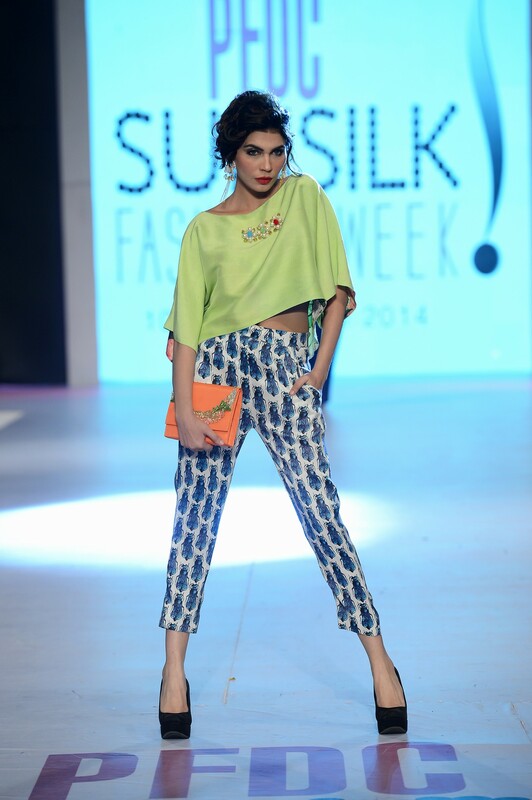 )… Also the first look the short crop top with those printed Capri pants..loved the look. 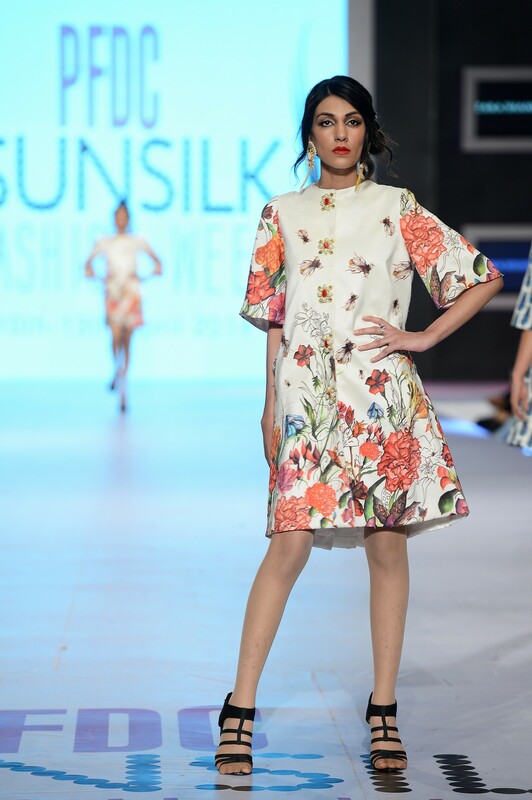 This entry was posted in Collections, Fashion, Fashion Week and tagged bug print, bug print fashion, bugs, crop tops, dresses, florals, jumpsuit, PFDC, PFDC Sunsilk Fashion Week 2014, PSFW, psfw2014, skirts, tops, womenswear, Zara Shahjahan. On the third day of the fashion week, the label I work for Daaman was showing therefore I had to be backstage and do all the running around with my co-workers and boss from model changes, to last minute pressings. For that I went for a basic white button down shirt with dark blue washed Levis denim. To add that pop, I went for this silk jacket that I had made. I found the double toned embossed silk fabric in the local market and had to go for a green since I lacked greens in my wardrobe. The fabric also had a very Tom Ford echo (another reason I chose this), and had gotten it made into the jacket. I went for a simpler silhouette sans any drama and additions so as to let the weave shine. The only thing I allowed myself were those gun metal grey buttons that contrastedthe color well. No better occasion than when you have your own fashion presentation. Easy to manage too, it was comfy and very breathable and I was easily able to run around in it amidst all the crazy-ness. I know i shouldn’t have but I did wanted to pull those sleeves up for a work-y/casual vibe to it. I finished off the look with trusted black suede slip ons that were sleek and pulled the whole look together. *Images courtesy Tapu Javeri, Amara from Pink 2.55 , and myself. 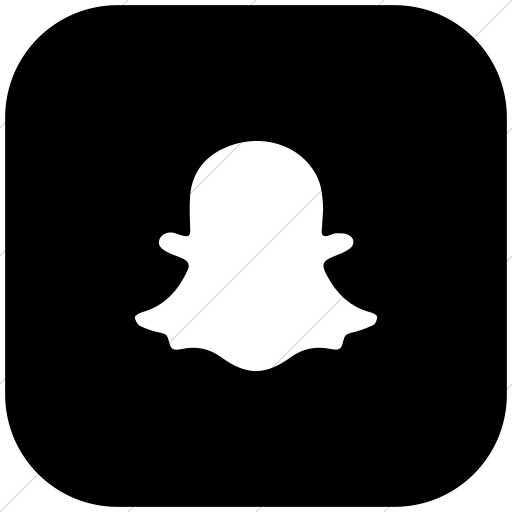 This entry was posted in Outfits and tagged dapper, Green, Green Jacket, jacket, jumpsuit, Levis, Levis Pakistan, man fashion, men's fashion, menswear, ootd, Outfit, Outfit of the day, silk jacket. So the story goes like I was keen to wear a jumpsuit and spotted one in the shoot by Bareeze and also a friend wearing one. It is one of my favorite pieces ever since I saw a couple on the runway of Hermes and was keen to try one myself. Fortunately I found a good breathable twill fabric and was able to get the perfect tailor for it. I had the jumpsuit made quite a while back but finally got the chance to wear at the red carpet of the fashion week. Wanted to go for a certain look therefore had to run around to get these combat boots just in the nick of time for the rough look I had in my mind. I pulled up the sleeves, but kept things simple and sans any accessories (though I do think dog tags would have been an interesting addition…there’s always next time). This entry was posted in Outfits and tagged combat boots, dapper, jumpsuit, man fashion, men's fashion, mens jumpsuit, menswear, ootd, Outfit, Outfit of the day.